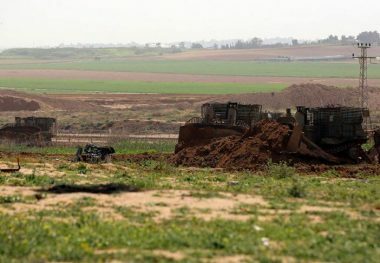 Several Israeli tanks, and armored military bulldozers, invaded on Thursday morning Palestinian farmlands in the southern part of the Gaza Strip, bulldozed sections close to the border fence, and fired live rounds. The soldiers fired dozens of live rounds into Palestinian agricultural lands, and at farmers, east of the al-Qarara town, northeast of Khan Younis in southern Gaza, forcing the Palestinians to leave in fear for their lives. The soldiers also invaded lands east of Abasan area, in Khan Younis, and bulldozed sections near the border fence, while military drones hovered overhead. It is worth mentioning that the soldiers, and for the third consecutive day, continued the installation of barbed wire fences, near the border fence along the eastern part of the Gaza Strip. In the occupied West Bank, the soldiers abducted, on Thursday at dawn, at least six Palestinians in the West Bank governorates of Jenin, Tulkarem, Qalqilia and Hebron, after storming and searching their homes. Also at dawn, the Israeli soldiers invaded Shu’fat refugee camp, in the center of occupied East Jerusalem in the West Bank, for the second day in a row, searched many homes and abducted at least eighteen Palestinians.